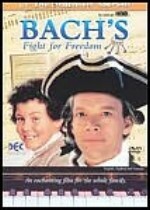 Set in 1717, Bach’s Fight for Freedom is a story about the positive power of ambition. It focuses on a temperamental, demanding composer and a free-thinking servant boy, both of whom feel like prisoners of circumstance. The last thing Frederick (Kyle Labine) wants to be when he grows up is a servant like his mother and father, who meekly labour for the duke at his castle in Weimar. Frederick aspires to be a stonemason. Meanwhile, Johann Sebastian Bach (Ted Dykstra) is terribly frustrated by being pigeonholed as the court organist. He wants to be allowed to compose the glorious music that springs forth irrepressibly in his mind. After Frederick is ordered to become Bach’s assistant, Bach is jailed for insubordination. Both of their futures seem bleak indeed. Eventually, though, they come to understand the essence of genius - when opportunity knocks, follow your dream with persistence and fortitude and you will triumph. This DVD can also be purchased in a 6-DVD boxed set with 5 other composer DVDs for $89.98 (save $29.90). Set in 1875 Bizet’s Dream tells the compelling and bittersweet story of the friendship shared by a young Parisian girl named Michelle Marin, and the great composer Georges Bizet, who teaches her piano.